Time is Mexico’s best defense against Donald Trump. The U.S. president-elect’s policies on trade and immigration, if enacted, could turn Mexico into the impoverished and less friendly country his overheated campaign talk decried. Political and economic reality, though, argues for patience. The peso weakened more than 12 percent against the dollar in the two days after Tuesday’s election. The last time it fell so dramatically, the U.S. president rode to the rescue, orchestrating a $50 billion emergency loan to help fend off a sovereign default. That was Bill Clinton in 1995’s Tequila Crisis, figuring that a stable, prosperous neighbor was better for America than the opposite. Now the United States is not the cavalry but the cause of the debacle. Mexico’s $1.2 trillion economy is in far better shape now, largely thanks to the North American Free Trade Agreement, which came into force at the start of 1994. Trump wants to rewrite or dump it, saying it’s too generous to Mexico and has destroyed U.S. manufacturing jobs. Cheaper Mexican labor has made its way into the business calculus of many U.S. companies. The country, for example, now accounts for around a third of the U.S. auto industry’s $150 billion of net annual imports, according to Evercore ISI. Yet the trade agreement helps the United States compete with China. Mexican purchases of U.S. goods and services support more than a million American jobs, according to the U.S. Department of Commerce. Mexican exports to the United States have increased more than 600 percent to some $320 billion a year since NAFTA came into effect. In Trump’s telling, the United States is swamped by Mexican immigrants, many with criminal intent. Yet domestic growth helped prompt more of the country’s citizens to return home between 2009 and 2014 than came to America, according to the Pew Research Center. Low oil prices have slowed the Mexican economy of late – and it could suffer further if the central bank decides to raise interest rates to protect the peso. Trump, though, cannot easily nix NAFTA. He can renegotiate it, but that takes time – and Congress has to ratify any changes. U.S. business leaders may meanwhile lobby against drastic action, while Trump’s plans to block Mexicans’ remittances home and build a border wall may face legal and budgetary challenges. 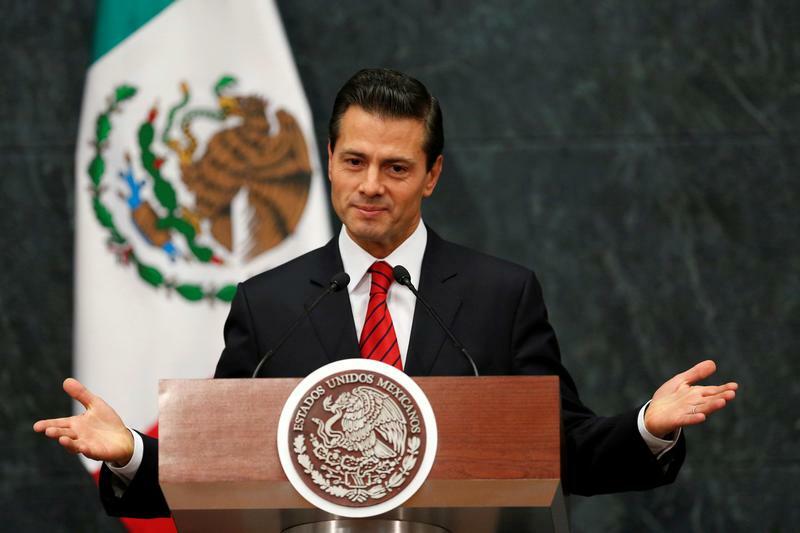 Mexico can feel justly aggrieved by his words. Its best move for now, though, is perhaps to turn the other cheek. 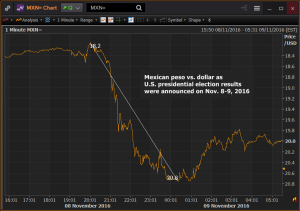 Mexico's peso suffered its biggest two-day tumble against the dollar in more than 20 years on Nov. 9-10 as investors worried about how U.S. President-elect Donald Trump's policies will affect Latin America's No. 2 economy. On Nov. 11 it slid to a record low over 21 pesos per dollar before bouncing back to around 20.72. Trump has said he intends to renegotiate or ditch the North American Free Trade Agreement linking the economies of the United States, Mexico and Canada. To put pressure on the Mexican government to pay for a wall he wants built on the border between the two countries, he may also seek to block billions of dollars in remittances that are sent home each year by Mexicans working in the United States. In addition, he said during his electoral campaign that he would deport millions of undocumented Mexican migrants.